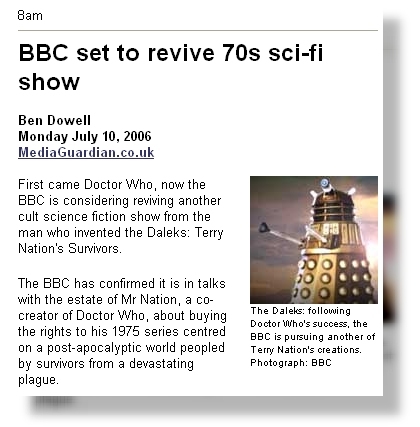 Confirmation that a new series of Survivors was to be made by the BBC came in a story published in Media Guardian on 10 July 2006. First came Doctor Who, now the BBC is considering reviving another cult science fiction show from the man who invented the Daleks: Terry Nation’s Survivors. The BBC has confirmed it is in talks with the estate of Mr Nation, a co-creator of Doctor Who, about buying the rights to his 1975 series centred on a post-apocalyptic world peopled by survivors from a devastating plague. The BBC is understood to be hoping to make a new series of six 60- minute episodes. The project is being overseen by inhouse BBC executive producer Sue Hogg and is one of a handful of Doctor Who-related dramas being planned by the corporation. One imminent drama is Torchwood, based on the fictional alien research centre in Doctor Who, which is currently being filmed. The BBC is not yet at the casting stage for the Survivors series, which would be dependent on the agreement of the Terry Nation estate. The original drama was seen through the eyes of two characters – Jenny Richards, a young working woman, and Abby Grant, a middle-class corporate wife living a privileged existence in a nearby commuter village. The women were played by Lucy Fleming and Carolyn Seymour respectively. The original programme ran for three series and 38 episodes, although Mr Nation left after the first series. He followed up Survivors with his next BBC sci-fi creation, Blake’s 7, about a ragtag group of criminals on the run from the sinister Terran Federation in a stolen alien spaceship. Mr Nation, who also invented the Daleks, is regarded as one of the creators of Doctor Who in the early 60s alongside then BBC head of drama Sydney Newman. The estate of Mr Nation, who died from emphysema in 1997, also jointly owns the copyright to the likeness and characters of the Daleks with the BBC. The news was quickly picked up by the sci-fi genre press, including Dreamwatch and SFX.